Barcelona & You i Barcelona, Spanien : Boka nu! We are located in one of the most vivid and great areas of Barcelona, one of the most multicultural cities across Europe. Just three minutes away from Sagrada Familia, one of the most relevant landmarks of the city. Las Ramblas and Mercado de la Boqueria is only 15 minute from our location by public transport as well as 'El Port Olimpic' and the most emblematic beaches of Barcelona. 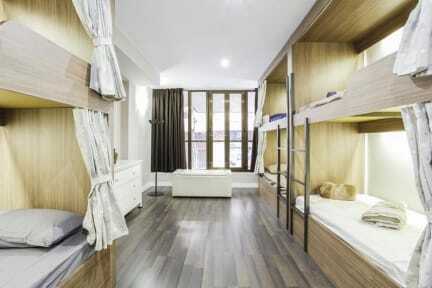 Then, other attractions such as el Camp Nou, Montjuic and Park Guell are quite easy to reach from our hostel. We also offer our place to artists traveling the world, so if you are an artist don't doubt and contact us! 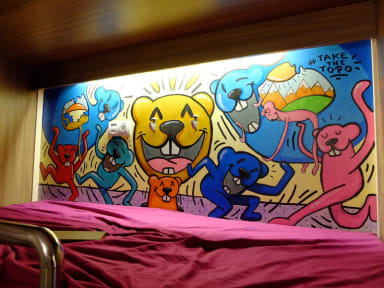 The Female Room consists of 4 single beds and is a great option for women traveling who prefer a woman only dorm. Each guest has access to a locker and key to keep luggage and valuables stored. Shared bathrooms are located outside the room in the hall. Our Mixed Room with 4 single beds is a great alternative for small groups traveling who wish to have their own private space. Each guest has access to a locker and key to store his/her luggage and valuable. Shared bathrooms are located outside the room in the hall. The Large Mixed Room consists of 11 single beds and a game area. This exterior room is divided into 2 parts, with a lot of open space to ensure guests are comfortable Each guest is given a locker and key to store his/her luggage. Bathrooms are shared and are located outside the room in the hall. Full size towels are available for rent for 2,50 euros.